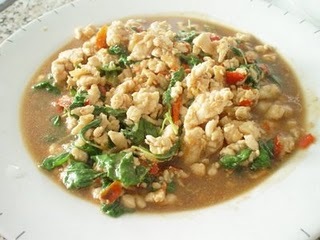 This Chicken Basil thai foods recipes is one of the best classics. It made using holy basil which has a slightly hot taste to it but you can use any sort of basil you like. 1. Heat a wok until the oil is hot, then stir in the garlic, and then add onions. Stir another few seconds before adding the chicken. Continue Stir-frying until chicken is cooked throughly. 2. Add chillies and sprinkle black soy sauce over the mixture and stir-fry another 15-20 seconds. 3.Then add fresh basil leaves and fish sauce to taste. Stir and mix well. Sprinkle with white pepper. Stir and transfer to a serving dish. Normally, Thai people love to eat this dish with steamed rice and fried egg.